Hello there, I am M. Sadegh Riazi and this is my personal website. 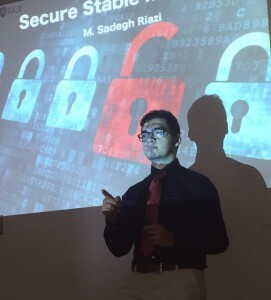 I am a PhD candidate in Electrical and Computer Engineering (ECE) department under supervision of Prof. Farinaz Koushanfar at University of California San Diego. I work on improving efficiency and applicability of privacy-preserving computation. In particular, I work on privacy-preserving machine learning. During summer 2016, I was intern at Microsoft in Azure group (Microsoft Cloud Platform). My project was to enable Microsoft Service Fabric Explorer (SFX) to visualize actor metadata for reliable actor services that are running in the cluster. In summer 2017, I was Program Manager Intern in Microsoft enterprise devision. My hobbies are hiking and photography. You can see some of my photos on my Flickr account.